Chris Pellegrini has spent almost half of his life coaching at West Springfield High School. 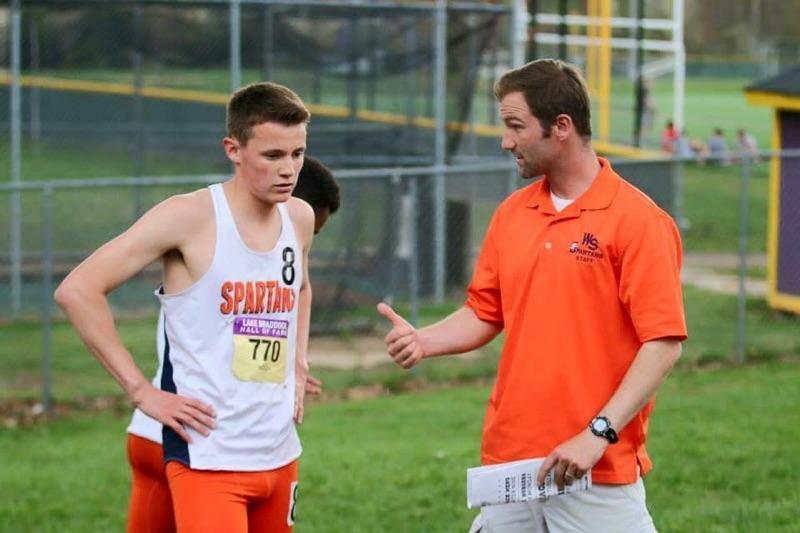 After he graduated from the Fairfax County school, he returned to his alma mater to serve as an assistant coach to the cross country program he cherished. Now, 17 years later, Pellegrini leads three sports, coaches more than 200 high school students and maintains a nearly year-round sports schedule. On top of that, Pellegrini is leading a girls’ cross country team that could be in contention to win a state title. Perhaps the boys, too. The 35-year-old admits that the “everyday grind” of both running and coaching appealed to him — although he wouldn’t describe himself as a stellar runner. But that desire to seek a challenge led him to approach then-cross country coach Vic Kelbaugh in 2001. As a first-year student at nearby George Mason University, Pellegrini figured he could assist the boys’ team and see how this coaching thing really worked. That passion for the job blossomed. He took on coaching the distance runners in the school’s track and field programs. By 2006, he was the head coach for both the boys’ and girls’ cross country teams; later, he became the head coach for both track and field teams. Add in his time as the head coach of the indoor track program and Pellegrini is looking at a pretty full plate. But he wouldn’t have it any other way. “I like routine, and I like building, and to me this is a never-ending building process,” said Pellegrini, whose time either running or coaching at West Springfield High School has encompassed 50 total seasons, or about 20 years. “I don’t know what that feels like to not have that 3 to 5 time slot filled,” he said of his typical practice time. Pellegrini has been an instructional assistant in the school’s special education department for more than a decade as well. And while predictability is nice, Pellegrini is looking ahead at a different kind of fall season. Although he is reluctant to talk too much about it, his girls’ cross country team could take home a state title in 2018. It would be the first state championship in his coaching career. In the 2017 state meet, the girls’ team finished third, behind Oakton and Lake Braddock — a school just a few miles from West Springfield’s campus. Pellegrini said the young team is “battle-tested” and versatile — featuring both cross county chops and track speed. But with its sights set on Lake Braddock, the team will need to stay healthy and focused, he said. Sarah Coleman, a West Springfield senior on the cross country team, said Pellegrini’s guidance and the team’s chemistry point towards a strong season. Pellegrini’s ambitions are bigger than him. Part of what drives him to want to win a state championship is to make his mentor, Kelbaugh, proud. “He is a tremendous coach — I probably learned about everything from him,” Pellegrini said of Kelbaugh, who coached the boys’ cross country team to a state championship during his 34 years at the helm. Kelbaugh agrees that a successful season is in Pellegrini’s future. Pellegrini has coached thousands of student athletes, and with each one of them, he tries to foster a love of the the sport. He wants his athletes to leave high school with fond memories and a passion for running; if they move on to compete in college, he wants to them to have room to grow. He enjoys seeing the athletes develop over the years — something he likens to starting and finishing a project. When Andrew Lackey started running in 2012, he said he was one of the slowest boys on the team — but Pellegrini pushed him over his four-year running career. He graduated as a top competitor on his cross country and track teams. Training high school students can have its own nuances, but Pellegrini said at the end of the day, it’s all about strengthening the coach-athlete bond. Pellegrini dwells on some of his own experiences as a runner to help him be a better coach. As a high schooler, he enjoyed the challenge of running, but often found pre-race nerves got the best of him and hindered his performances. Now “relax” is one of his more common ideas he communicates to his athletes. Pellegrini’s enthusiasm has inspired her beyond the course or track: she wants to be a coach some day. “I want to make runners feel the way that he does — that you can do anything you put your mind to in the sport,” Coleman said, adding she hopes to one day coach cross country at the college level. Could a future as a West Springfield coach be on the horizon? “If the opportunity comes up, I wouldn’t mind,” she said. At West Springfield, track season ends June 15 and cross country practices begin on July 30. That leaves Pellegrini a month and a half when coaching is not on the calendar. But that doesn’t mean the work is done. “I’m never off the clock; I never stop thinking about it,” he said, adding that’s the case particularly heading into a fall season loaded with expectations. He’s grateful for his patient wife of six years, who knows that his work is never done and that texts, phone calls and emails from athletes or parents happen year round. During his less busy weeks in the summer, Pellegrini logs some miles of his own. It’s an attempt to try to keep up with his own athletes at the beginning of the season. “If I can’t show them I can work hard to reach a goal, I’m afraid I would lose some of my credibility,” he said. That’s part of what has allowed him to be so reliable, Kelbaugh said. People know Pellegrini is committed to the school and the athletes — no matter the time of year. So what’s in Pellegrini’s future? Are more decades leading the teams a possibility? “The more I look at it, it becomes harder and harder to think that I’ll actually leave,” he said. At one point he wanted to be an assistant coach at the collegiate level, but now he recognizes the challenges and rewards that come with being a high school coach — and that’s enough to entice him to stay. More immediately, he has the cross country post-season to focus on. His girls won the Third Battle Invitational Oct. 13, demonstrating a depth West Spring has never seen — five runners under 19 minutes. The boys also have a shot at a 6A state title, with three underclassmen finishing in the top 15 to finis second to 4A powerhouse Loudoun Valley.